In an effort to try and ensure the Cosmic Cube (seen in the movie “Captain America” and “The Avengers”) doesn’t fall into the wrong hands, Thor decides to smash it into smithereens with his mighty hammer. Considering the Cube is extremely powerful, Loki (Thor’s brother/nemesis) decides to try and clone it so he can keep the power for himself. 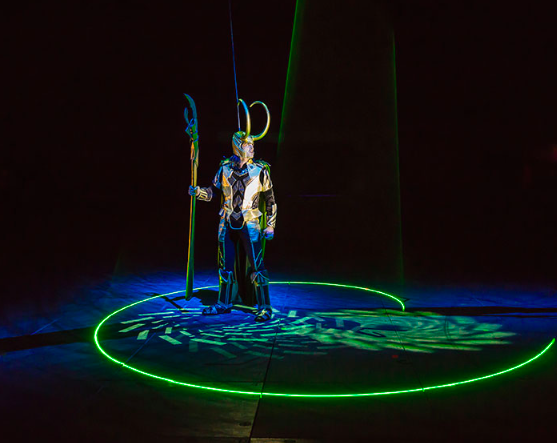 Thus begins a new arena spectacular, as the Feld Entertainment-produced Marvel Universe Live debuted back in July in Tampa, Florida. As the story goes, Thor has to assemble all his buddies like The Incredible Hulk, Spider-Man, Captain America and even the X-Men. Consequently, Loki builds a small army of his own from Doctor Octopus, Hydra, Electro and the Red Skull in what becomes an extremely hi-tech battle of good versus evil. All together over 25 characters appear during Marvel Universe with a total cast of over 50 performers. Auditions were held in Las Vegas, New York and even Orlando to find the right mix of actors who could not only portray the iconic characters, but could bring a unique skill set to the table. The cast includes Phil Smage, three-time X-Games champ and professional snow-skater playing Captain America. Black Widow is played by two-time WXM pro-champion Louise Forsley. 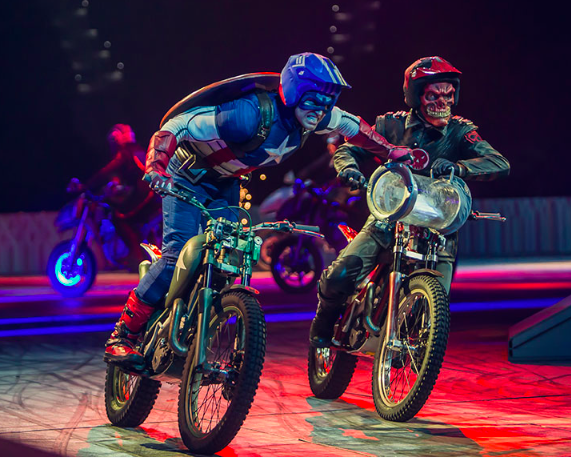 Marvel Universe Live is said to be the most advanced arena show of its kind. It utilizes new projection technology and a “multilevel aerial space” that has never been used before. I am truly looking forward to seeing this show when it rolls into Orlando from December 5 – 7. Want more information? 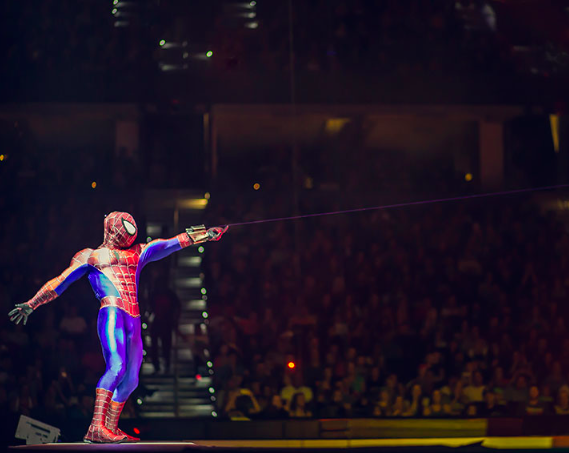 Visit www.MarvelUniverseLive.com and you can actually save 25% on tickets with discount code: SAVE25. Make sure and follow Theme Park University for all the latest news in themed entertainment on Twitter by clicking here and on Facebook by clicking here! 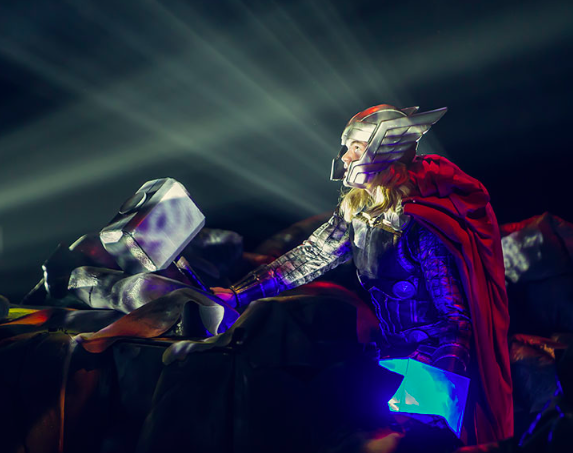 Disclaimer: Feld Entertainment is providing Theme Park University tickets to Marvel Universe Live, so please check back in a few weeks for a review of the show! This entry was posted in Outside The Parks, Spectacles and tagged Arena Shows, Cosmic Cube, Feld Entertainment, Marvel Universe Live, Thor. Bookmark the permalink. Trackbacks are closed, but you can post a comment.